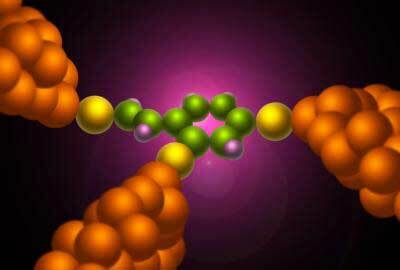 (Nanowerk News) University of Arizona physicists have discovered how to turn single molecules into working transistors. It's a breakthrough needed to make the next-generation of remarkably tiny, powerful computers that nanotechnologists dream of. They have applied for a patent on their device, called Quantum Interference Effect Transistor, nicknamed "QuIET." The American Chemical Society publication, Nano Letters,"has published the researchers' article about it online. The research is planned as the cover feature in the print edition in November. A transistor is a device that switches electrical current on and off, just like a valve turns water on and off in a garden hose. Industry now uses transistors as small as 65 nanometers. The UA physicists propose making transistors as small as a single nanometer, or one billionth of a meter. "All transistors in current technology, and almost all proposed transistors, regulate current flow by raising and lowering an energy barrier," University of Arizona physicist Charles A. Stafford said. "Using electricity to raise and lower energy barriers has worked for a century of switches, but that approach is about to hit the wall." Transistors can't shrink much smaller than 25 nanometers, or 1/40,000 the width of a pinhead, because scaling down further creates intractable energy problems, Stafford said. Even if it were possible to build an ultra-advanced laptop computer with molecule-sized transistors using current transistor technology, it would take a city's worth of electricity to run the laptop, and the thing would get so hot it would probably vaporize. Stafford, UA physicist Sumit Mazumdar and David Cardamone, who received his doctorate from UA in 2005, began thinking about the problem of next-generation transistor technology three years ago. They realized that quantum mechanics can solve the problem of how to regulate current flow in a single-molecule transistor that would work at room temperature. The transistor is turned on by changing the phase of the waves so they don't destructively interfere with each other, opening up additional paths through the third lead. According to the Semiconductor Research Corp., it typically takes a dozen years for a new idea to go from initial scientific publication to commercial technological application, Stafford noted. "That means if the computer industry is to continue its recent pace in making smaller-scale computers, we should have had this idea yesterday, " Cardamone said. "Have you seen the movie, Fantastic Voyage?" Stafford asked. A nano-sized surgical team journeyed through a human body in the 1966 sci-fi flick. That's a different story, but with a similar theme. "We're not futurists at all and can't predict it, but imagine that you could make an artificial intelligence, that you could have this little submarine that goes inside somebody's arteries and capillaries to repair them," Stafford said.